It's that time of the year again when I do the one day, one photo series. Summer has gone and all we have to look forward to are colder, greyer and shorter days. But in order to preserve the mood before SAD sets in I like to think fun, happy, thoughts. So today I will start with one of my favourite places.....The Goyt Valley. My days in Macclesfield are finally over. I have checked out of my flat and am now fully fledged back in London. But I couldn't leave without having one last spin along some of the most beautiful lanes in England. My route started in Macclesfield and for those who know it I was very quickly on that well-known twisty climb, the Cat-and-Fiddle. Once at the summit I dropped down to Derbyshire Bridge and meandered along the Upper River Goyt to the Errwood and Fernlee reservoirs. One of the most beautiful views at this time of year is the purple patchwork carpet on the side of the hills from all that lovely heather. At this time of year it glows the carpet glows in the sun. This road drops down steadily without it being one of those screechingly steep descents. Furthermore there is hardly any traffic, so you can really appreciate the full beauty of the area. By jove, I felt wonderfully spoiled! Sadly, my camera just couldn't do the scenery justice so I didn't take any photo! The photo above is from another part of the Goyt valley (approaching from Long Hill), with the Errwood reservoir in the distance. If you want to know what I am raving about I would recommend going there on any sunny day in September and you will see what I mean. For your interest, my ride continued in equally scenic areas but with hard work in equal measure! I tackled The Street, Pym's Chair, Jenkin Chapel and Saltersford all one after the other before dropping down Blaze Hill to Bollington and back home. 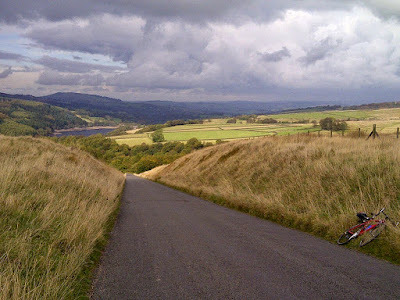 I had a good fill of The Goyt Valley and the Cheshire lanes for a while! Looking forward to returning there before long.